Charleston WV — June 23, marked the one-year observation of the devastating flooding that impacted many parts of West Virginia. West Virginia Rivers Coalition is launching a crowd-sourced photo documentary project on one of the impacted rivers — the Elk River — to document lasting effects of the flood. People interested in contributing to the project can download a free app called Water Reporter; download the app here, to their phones. The app allows users to upload photos to an online map, creating an inventory of potential cleanup projects. Anyone who spends time on or by the river is invited to contribute. Although much of the Elk River is once again open for recreation, there are still dangerous spots containing debris like household appliances, tires, and home furnishings. “Several affected communities still have a long way to go to fully recover. Seeing the river restored to its health and beauty is part of that healing process. 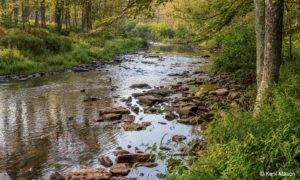 This project is a way for people to help identify areas of the river itself that still need attention,” said Angie Rosser, WV Rivers Executive Director. 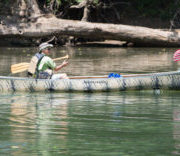 The photo documentary will be on display during West Virginia Rivers’ Elkspedition Picnic & Paddle. Scheduled for Labor Day, September 4, at Coonskin Park, the free event invites paddlers of all ages and skill levels to participate in a 3-mile float on the Elk River ending at Coonskin. Paddlers will be welcomed with a free picnic and family friendly Elk River festival once they are off the river. The Elkspedition Picnic & Paddle is part of the Waterkeeper Alliance’s SPLASH event series and benefits the West Virginia Headwaters Waterkeeper, a program of West Virginia Rivers Coalition. 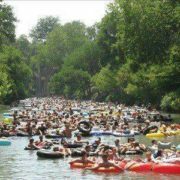 For information on the Elkspedition Picnic & Paddle, click here. For more information on the and the Elk River photo documentary project, click here. 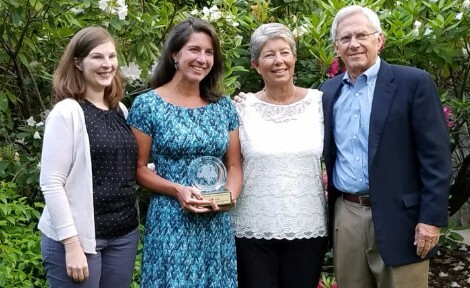 WV Rivers’ executive director Angie Rosser, second from left, with staff member Kathleen Tyner, mother Annette Lang, and Annette’s husband Bob Lang. 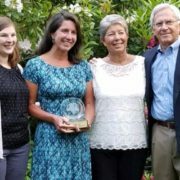 The National Wildlife Federation named Angie Rosser of the West Virginia Rivers Coalition the recipient of its 2017 Charlie Shaw Conservation Partnership Award. The award honors one person each year from among the Federation’s affiliates; WV Rivers is the NWF West Virginia affiliate. Rosser was honored for her efforts to protect rivers and wildlife habitat in West Virginia and nationwide. “The words ‘fearless,’ ‘tireless’ and ‘effective’ perfectly describe Angie Rosser’s advocacy for West Virginia’s waters and wildlife,” said Collin O’Mara, president and CEO of the National Wildlife Federation. 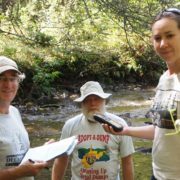 “Thanks to Angie’s leadership, the West Virginia Rivers Coalition has broadened its reach and increased its impact. She is a phenomenal partner, and we are honored to have her as part of the Federation family. 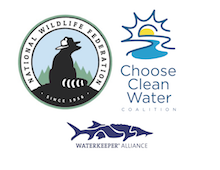 Called an integral part of the National Wildlife Federation by O’Mara, Rosser serves as co-chair of the Federation’s Water Caucus and as co-chair of the Choose Clean Water Coalition, which works to protect and restore the Chesapeake Bay Watershed. Rosser works to create partnerships on conservation issues with leaders from across the country, but it’s her deep passion for the work that inspires others in the National Wildlife Federation and beyond. 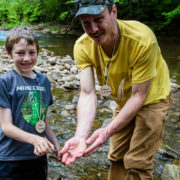 You can read more about the collaborative partnership and shared values between National Wildlife Federation and West Virginia Rivers in this joint op-ed published in the Charleston Gazette-Mail. To an outsider looking in, these seem like especially uncertain times in Congress. But what does it look like from the inside? I got a peek a few weeks ago, and offer my insights here. First a bit about me. 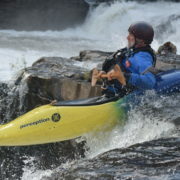 I left a teaching career and moved to West Virginia in 1984 to pursue my budding passion for whitewater, training as a guide on the New and Gauley rivers. In the early ‘90s, I helped found Friends of the Cheat when a massive acid mine drainage blowout turned the Cheat River orange and lifeless. I stepped aside from managing a rafting operation on the Cheat to lead the early years of the fledgling organization that today has brought the Cheat back to life. Since then my work has bounced back and forth between environment work inside and outside government, and leadership roles in the outdoor recreation industry. Today I do contract work with professional outfitters and with the West Virginia Rivers Coalition. And I still guide, as well as paddle, bike, hike, and hunt at every opportunity on and in the many wild and wonderful rivers and forests of the state. So what took me to DC? National conservation organizations periodically organize “fly-ins” to bring concerned citizens from their respective states to meet with their elected representatives and/or their staffs. I have participated in three (although I drive my Prius to them, rather than “fly in”), representing the interests of whitewater raft outfitters in our state. The first two focused on appropriations for the Land and Water Conservation Fund, which uses royalties from offshore oil and gas leases to buy land within the boundaries of national public lands. The bottom line is that LWCF improves recreation access. This most recent fly-in was to promote the values of public lands and protect the Antiquities Act — the tool that empowers presidents to create national monuments on already-owned national public lands. I never know on these trips whether I’ll get actual face time with elected representatives or only their staffs, but both can be effective. Staff can spend more time learning about the specifics, and know how best to pass what is shared to their boss. And it’s always great to speak in person with a Senator or Representative. On a previous visit, I had a few minutes with Senator Manchin and extended time with Representative Jenkins. This time I had 20 minutes one-on-one with Senator Capito. After we covered my planned talking points, she questioned me at length about opportunities and challenges for whitewater companies in the state. I came away with a sense that the uncertainty I feel outside the Beltway is alive and well inside it. Still, I get the sense the staffs and Congressional members are dedicated to doing the best they can can to protect the interests of West Virginians. I felt my input was valued. Time will tell how well our public lands continue to be valued. Public lands are vital to the outdoor recreation economy. Too often I hear perspectives that pit public lands against business interests, but in my business we depend on public lands and waters for our very livelihood. Without public accesses, we would be unable to take our guests rafting. Without protected resources, we would have nothing to show visitors to entice them to return — so they can spend their money not just with us, but on a wide range of lodging, dining, and other businesses during their stays. So it’s not just outdoor recreation businesses that rely on public lands, it’s all the businesses that benefit from tourism enabled by those lands. According to the Outdoor Industry Association, outdoor recreation nationally generates $887 billion in consumer spending, and provides 7.6 million jobs. The group’s most recent figures for West Virginia show the outdoor economy supports over 82,000 jobs and generates more than $532 million in state and local tax revenue. That’s why I went to DC. This isn’t about tree huggers versus business leaders. This is about jobs. This is about jobs that can’t be outsourced to China. This is about keeping a roof over our heads. So I shared how tens of thousands of West Virginians like me make their livings off of public lands and the outdoor recreation economy. I also went because it’s not just about business. I’m passionate about outdoor recreation. I wanted to make sure our delegation knew how important public lands are to our state’s identity. A recent survey by the Global Strategy Group showed that a staggering 96% of West Virginians agree that public lands and the access to hunting, fishing, and recreation they provide are important to our quality of life. Most of West Virginia’s delegation support public lands — most of the time. I want to make sure that when pressure mounts to make deals, they are paying attention to what we West Virginians value. Stay informed about public lands policy by signing up for the West Virginians for Public Lands e-news at http://tinyurl.com/wvplenews.